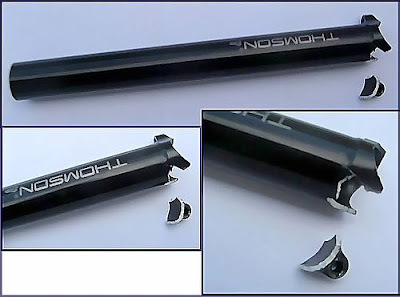 I wrote earlier about two recent incidents of Thomson Elite seatposts breaking during use, without any prior warning to the users (see here and here). I persisted in trying to extract as much information from Thomson about these happenings. Two phonecalls and an email to them never went through due to some obvious hindrances but just earlier this week, I was able to converse with David Parett, a manager and PR specialist at L.H Thomson Inc. Although they are a relatively small company, they seem to take pride in the fact that apart from the cycling side of the business, they're also a contract manufacturer designing and making parts for clients such as Boeing, Trane, Ford, Coors, Reliance Electric and so on. One can imagine that to gain the trust and business of such big name companies, you'd find it absolutely necessary to have sound manufacturing and quality control down on the floor. One of the owners of the posts (with the broken head) sent it in to Thomson for analysis. When I talked to the user, he made the comment that he was 100% certain he used a torque wrench to tighten the bolts before use (documented here by 'Apacherider'. He reported he used a Park Tool torque wrench that only goes to 60 in-lbs which is the max torque recommended by Thomson for the bolts). However, the following is what Dave had to tell me from first impressions. Read it, and leave a comment if you would like to roundtable a discussion. Dave : "There is no question that this failure was related to torque. This was easy to see as when I got the broken post, two divots caused by the bottom clamp had formed in the cradle of the post. We know how much torque that takes, and it is a big number. The user may feel they torqued it properly but there is ample evidence that is not true. I think most parts will fail if abused in such a manner. Imagine overtorqued handlebars, stripped pedal cleat bolts, etc. Or think of a car. If you torqued a sparkplug to 3 times the suggested value,what do you think would happen? We know from testing here at Thomson that there is no other way one could create those divots unless you overtightened the clamping bolts." Dave : "I also observed that the bolt heads are distorted. The bolts are grade 12.8. We know how much torque it requires to distort the bolt heads, and it is in excess of 125 inch pounds. Further, the metal shows no signs of material contamination, and the post is within spec as far as dimensions go. We have a lab here and we have examined the post. Moral of the story is, 2.5 to 3 times the recommended torque will break things." Dave : "I verified our anodic coating thickness. It is about .001" thick. Yes, anodizing cuts fatigue life, almost to 50% the original. But we engineer around that. Our post is heavier than it would otherwise have to be to deal with that. If you thinned it out, it would be susceptible to being crushed by clamping. Paint or powder coat cannot provide this kind of corrosion protection.The ridges may help with slipping, help keeps the finish from scratching and is also cosmetically appealing to some people. The finish changes near the radius at the seatpost head to help prevent stress riders." Dave : "The other post has not come back here as far as I know, but all our testing indicates it takes in excess of 600 pounds of force to cause an ear to fail and it would not fail in the manner it did. A brittle failure like that is again related to torque. Testing here shows that the original design idea is still valid. A riding event or accident results in a bend. All components of the top of the post, bolts, clamps, barrel nuts, ears are stronger in relation to the tube. If there is a big hit, the post will bend and the clamping mechanism will not fail. You can negate this by putting the ears under severe tension with torque." Dave : "The anodizing is done in Reading, PA, The Al ore is from Quebec, CA and the extrusion is done in Minnesota. All the fasteners are from Chicago and Cleveland. All of them are certified and rechecked by us. There are barrel nuts and bolts in receiving inspection right now, placed under a heavy load. If we observe any failures in the entire shipment, it will be tested and possibly rejected. I don't think anyone does that but us. From filming riding, we have a series of in-house tests that were used in design and are still used on every lot of material. Bolts, washers and everything are checked for ultimate strength, fatigue life and corrosion resistance using a 500 hour salt spray test. We also had a German lab check our posts to the CEN standard. We think the CEN is a poorly designed test, but we passed it as well. The 500 hour salt spray test is run on samples from each anodize lot to verify quality. Further, we have a fatigue tester. We can put a post in it, set the bolts at the level the customer had them and create that failure. There just is no question of what happened after that. We expect our products to last for 10 years in the field under normal conditions. If a customer experiences an issue, we replace the part for goodwill. My frustration with all this is there is not a single company out there that does 10% of what we do to check incoming material quality, 100% checks at each machining operation, and certification and testing of all components. Our bike parts are built to the same standards, in some cases higher, than the airplane parts we make." Torque Wrenches - How Good Are They? The comments on the bolting ear breakage looks like a pile of bull. How will a rider, merely picking up his bike from the ground by the saddle generate 600 pounds of force?? Funny how it's always the consumer's fault when a Thompson part breaks. It's almost as if they believe that 100% of the parts they turn out are flawless, when we all know that's statistically impossible. @Anon : All process has variations. What is statistically possible though with something like Six Sigma is to reduce the likelihood of unexpected failures to less than four one-millionths. I don't know what Thomson's control charts look like so I cannot make any claim like you have done, which seems to be saying that these are not isolated events and that they are definitely manufacturer defect. I think you should ask for copies of the calibration certificates for the customers' torque wrenches. What I don't understand is that these bolts in question never actually failed, however it was the head that completely fatigued out. I cant see the relation between overtightening a bolt and a fatigue failure in a region much below it. How is this failure related to over tightening the head bolts? I smell a rotten fish. I have a Thomson masterpiece purchased about 1 year ago. The original paperwork that came with my seat post lists the torque for the seat clamp bolts as 60 inch lbs. (6.8nm). Today I downloaded the PDF from Thomson's website. Currently they make a notation that the torque value for the masterpiece is no more than 45 inch lbs. (5.1nm). The Elite value is still listed at 60 inch lbs. Has something changed about the Masterpiece design in the last 12 months that relates to this new lower torque value? The fastener load is transferred, that should be easy to understand. You can take a fresh part, overtighten it and look for haze in the anodized surface. Interesting to see how load moves through the part. FEA will show you as well. The fasteners place the top of the post in tension against the force of the clamps. The radius from the head/ear area transfers some of the load from the top to the tube. Here is the thing on the post. He may have used the wrench when he set it up originally, who knows, sounds like he is sure he did. No reason to dispute that. The point is that at some point in its life something happened to distort the allen sockets on the bolt heads and something caused divots to be formed in the cradle by the bottom clamp being forced into the cradle with a lot of force. Now that force comes from only 2 things, fastener load or an "event." I can't tell which, but it was one of the two. The post was in service for 4 years or so, it is conceivable that it was tightened more than once in it's life. If the anodic coating failed, you could get stress corrosion, but there is no evidence of that in this post. Let me repeat this part: Something exerted enough force on the post that the bottom clamp was driven into the cradle at the top of the post, and caused the clamp to dig into the material. Something happened to the post, either fastener load or an event. This is the one point that has not been answered and it is the answer that would tell us what happened. I am not sure why this is hard to grasp. Pick a bike part, tighten down to 2.5 to 3 times rated torque and observe. Is that really not as simple as it sounds? I can simulate the failure the guy had here. Just not sure what the confusion is. You take a setback post, tilt the saddle nose down, take the bolts to just before yield, and you will get the divots I see in this post. Keep in mind these are grade 12.8 steel bolts, with threads rolled after heat treat. They can take a high load. The heads of the bolts showed twisting/distortion that indicates they were near yield. So, is Thompson specing a bolt which allows for a toque load greater then the body of the post can handle? Why not change the bolt to a model that will fail before the body does? The bolts should begin to fail at 125 inch pounds, and that is what I think I am seeing in the twisting distortion of the heads of the bolts. Grease under the head/washer makes this easier to do. Two considerations. In a riding generated failure you want the clamps, ears and bolts to fail at a very high point, and you want the bolts to never fail first. The clamp can absorb energy if the bolts remain intact and the clamp bends. The point is for a large wreck to end with the saddle still attached. When we first designed the post, and this was true on the stem as well, many posts that would have otherwise tested OK, failed because the bolts failed. I personally tested one name brand post that we could not get the bolts to the specified torque without shearing the heads off. Another would only run for about 50 cycles in the fatigue machine before the saddle was pointing skyward and the single bolt bent. This was a $300+ post. Overtorque or clamping high (think bmx bike) on the post can negate the bending fuse. The post did not fail from taking a hit, the top end failed from excess tension from the fasteners. Again, the divots tell me what happened. If there were no divots, it would be more of a head-scratcher. Properly torqued bolts should not loosen, and riders should resist snugging. A bike is in many ways delicate. Carbon bars will not respond well to snugging. Front derailleur clamps can crush a seat tube. 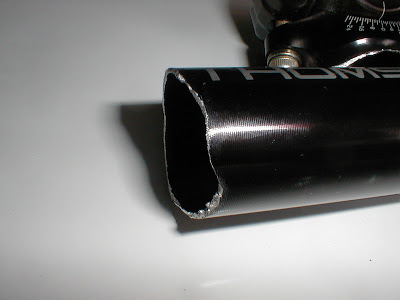 Bike shops see broken seatpost collars frequently. We should design things with some cushion, and we do, and riders need to know the limits of their mechanical skill. My car has a turbo and direct fuel injection. I would not touch that motor as I am not qualified. I would not try to build a wheel. I am sure I could learn, but right now I don't know how. I would repair a surf board, but not a carbon fiber bike frame. My point is I think people don't take bikes seriously enough sometimes when it comes to working on them. Not to say they can't learn, they can, and do. Here's the thing. He probably did use a torque wrench, sound like he did to me. His wrench is probably not horribly out of cal. All it takes is one instance on a trail of adjusting or tightening, then you forget, and it just stays there. The other thing is if someone hears a squeak, they might snug everything up. The post was in use for 4 years, he could easily have forgotten about something that happened. The last issue is a work habit. Grease under the bolt head or the washer or both, gives you a false low on the wrench. Most torque values are set with only grease on the thread, or no grease at all. If you grease under the bolt head it changes everything. One of the reasons we don't make a road stem any lighter than we do are these issues. I am getting feedback from people who handle warranties for other brands of threads pulled out of stem bodies and bent or cracked clamps. Those stems would be fine if installed correctly.